2-3 students can learn together! Perfect for siblings or friends to get started on the same instrument. Additional activities such as duets and age-appropriate music games are incorporated in lessons for more hands on interaction and fun! 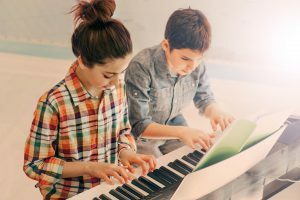 Develop individual technique, musicality, and individual musical interests before moving to private lessons. Recreational and Traditional Semi-Private Music Lessons are offered year round for all instruments and voice. Schedule a FREE Consultation Today!